With sleek aesthetics and exceptional performance, the ultra-fast smc PENTAX FA 31mm f/1.8 Limited is the wide-angle lens of choice for those who appreciate engineering mastery, as well as masterful image reproduction. 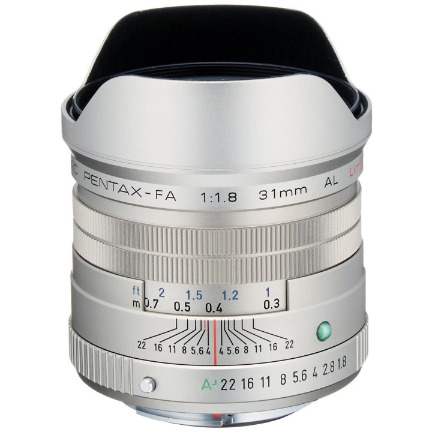 It features outstanding sharpness and clarity, in a compact all-metal housing that characterizes all PENTAX Limited lenses. The thin, lightweight design makes it an ideal carry anywhere lens. The limited lens series quality offers distinctive visual appeal and a premium appearance with its polished metal design. This lens incorporates a glass-molded aspherical lens elements to minimize spherical aberrations. The versatile angle of view produces natural images with a moderate perspective or an expanded depth of field, making it ideal for many different types of subjects and occasions, from snapshots to landscapes to architecture.